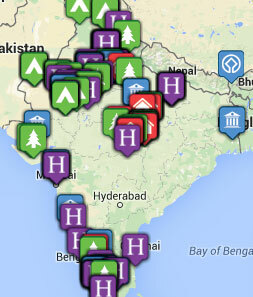 Tribes Overall: "We were thrilled with our well-planned and varied experience in India. The ONLY exception was Bandhavgarh." Tribes Service: "Paul listened to our wish list and added his own suggestions to produce a wonderful itinerary." Guides: "Some were outstanding eg. The naturalists at Chambal and Satpura and our guide at Khajaraho. Our first driver/guide, Mr Singh, was definitely moody! Forest Department guides at the reserves were very hit or miss- some contributed greatly and others seemed there for the ride. We actually ended up paying to get a particular guide in Kanha as we weren't prepared to have a poor one." Social & Environmental Responsibility: "Whatever one feels about the poverty in India, tourism provides employment for so many people. The involvement of Forsyths Lodge in the local community at Satpura was exemplary: they use part of their income to fund the local primary school and pay for healthcare of workers." A wonderful start to our holiday. The sympathetic renovations created a calm, colonial feel much appreciated after the dreadful road to get there! The river safari was magical and sightings far exceeded our expectations. A totally different experience from other lodges. You are made to feel a guest of the family and everyone is involved. Guides and naturalists join you for meals to make them a lovely experience. The food is amazing. A modern functional hotel that could have been anywhere in the world but fine for one night. Wonderful: we cannot fault the beautiful rooms, food and staff. We probably had the best lodge in the place! Many are so surrounded by tall bamboo that they have no view at all. Ours had an open aspect with a wonderful flame of the forest tree in full bloom and teeming with beautiful birds right in front of us. Food good but little variation. Lovely rooms, food and a superb position. Very nice to have the complimentary use of their boat to have a second viewing of the Aarti festival from the river. "The truly magical encounter with a female tiger in Kanha who was so close that I could have touched her. She turned her head to gaze into my eyes before slowly ambling away."